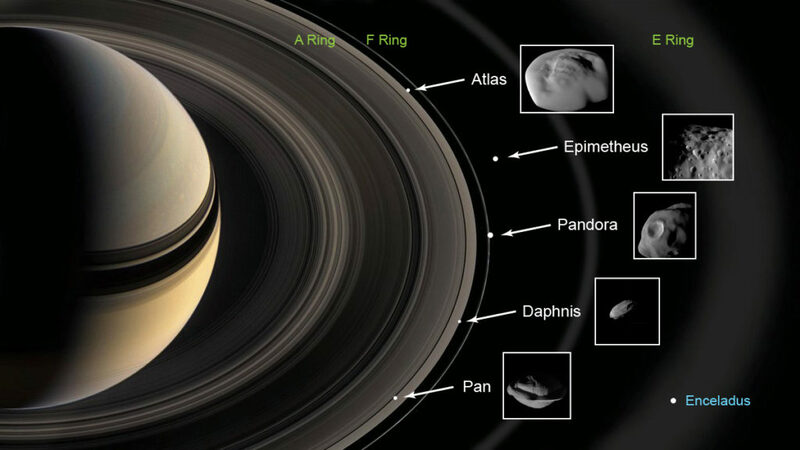 March 31, 2019 – New findings have emerged about five tiny moons nestled in and near Saturn’s rings. The closest-ever flybys by NASA’s Cassini spacecraft reveal that the surfaces of these unusual moons are covered with material from the planet’s rings – and from icy particles blasting out of Saturn’s larger moon Enceladus. The work paints a picture of the competing processes shaping these mini-moons. The new research, from data gathered by six of Cassini’s instruments before its mission ended in 2017, is a clear confirmation that dust and ice from the rings accretes onto the moons embedded within and near the rings. The key puzzle piece was a data set from Cassini’s Visible and Infrared Mapping Spectrometer (VIMS), which collected light visible to the human eye and also infrared light of longer wavelengths. It was the first time Cassini was close enough to create a spectral map of the surface of the innermost moon Pan. By analyzing the spectra, VIMS was able to learn about the composition of materials on all five moons. VIMS saw that the ring moons closest to Saturn appear the reddest, similar to the color of the main rings. Scientists don’t yet know the exact composition of the material that appears red, but they believe it’s likely a mix of organics and iron. The moons just outside the main rings, on the other hand, appear more blue, similar to the light from Enceladus’ icy plumes. The six uber-close flybys of the ring moons, performed between December 2016 and April 2017, engaged all of Cassini’s optical remote sensing instruments that study the electromagnetic spectrum. They worked alongside the instruments that examined the dust, plasma and magnetic fields and how those elements interact with the moons. Cassini’s mission ended in September 2017, when it was low on fuel. Mission controllers deliberately plunged Cassini into Saturn’s atmosphere rather than risk crashing the spacecraft into the planet’s moons. More science from the last orbits, known as the Grand Finale, will be published in the coming months. The Cassini-Huygens mission is a cooperative project of NASA, the European Space Agency and the Italian Space Agency. NASA’s JPL, a division of Caltech in Pasadena, manages the mission for NASA’s Science Mission Directorate, Washington. JPL designed, developed and assembled the Cassini orbiter. The radar instrument was built by JPL and the Italian Space Agency, working with team members from the U.S. and several European countries.